Empire Storage and Gated Parking provides safe, affordable storage solutions to the Rochester NY region. Since 1954 this family-operated business has been developing the complex at the end of Irondequoit Bay. The location is naturally secluded and further secured with gated access. 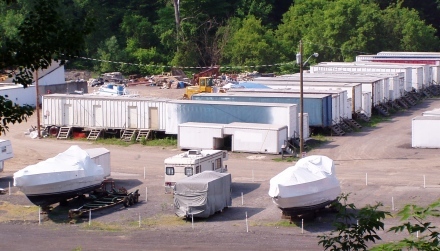 The Empire Storage facility includes numbered, open-air storage spaces for medium- to long-term boat or vehicle parking, self-storage units and boxes, and buildings used for garages or industrial shop space. Our location is minutes from Rte-590N, Rte-104, conveniently located for vehicles traveling through Monroe and Wayne County. Our proximity to Lake Ontario launch points makes us an ideal boat storage choice. Vehicle storage spaces used by owners of boats, motorhomes and other recreational vehicles (RVs) for off-season parking. Self-storage units of varying size or van boxes and trailers provide generous space with lockable, drive-up access for material storage by contractors and private individuals. Multi-garage buildings with concrete floors and full utilities are used for vehicle parking, contractor work areas or material/parts stockpiles. Our clients use such industrial shop space for small businesses such as motorcycle repair or printing presses. Our office is within the storage complex, providing us oversight and resulting in prompt response to customer needs. All facilities and storage units are maintained to their best condition. Our automated security gate grants 24-hour access by individual security code to customers using our facility off-hours. We offer fair pricing with reasonable rental durations on each of our storage solutions. We are the trusted partner and problem solver of many regional contractors, their materials and vehicles. Empire Storage is ready to provide you storage solutions, and we invite you to review them on this website – then contact us regarding your needs. We also have comprehensive storage solutions south of Rochester at our Commerce Drive facility in Henrietta. That location is convenient to the NY State Thruway (I-90) and southern suburbs. Contact us for more information. Our Empire Boulevard location supplies Rochester’s Best Dirt. Visit our soil & fill web page, then contact us with any Rochester regional topsoil and fill dirt needs.